There are SO many resources and links out there regarding transgender and GNC student support. Colleagues have asked where the best place to start if they have limited time or they want to pass starter resources to other colleagues so they can start their learning journey. Recently, I presented a workshop about inclusive strategies for transgender and gender non-conforming students at the Minnesota State Academic and Student Affairs Equity and Inclusion Conference. I wanted to share some of the resources I have found the most useful in informing allies and accomplices in their earlier stages of learning about the experiences of transgender and gender non-conforming students and colleagues. These resources are practitioner-oriented and primarily student-focused to ensure you can move from information gathering to action in enhancing campus climate for transgender and gender nonconforming individuals. The most comprehensive resource I return to time and time again is the Consortium of Higher Education LGBT Resource Professionals (I call them “the Consortium” to save some life force). I can’t rave enough about the powerful model of collective information and knowledge sharing between practitioners. If you are not a member yet, I strongly suggest you become one. They don’t turn anyone away for lack of funds, so they can make it accessible for all. 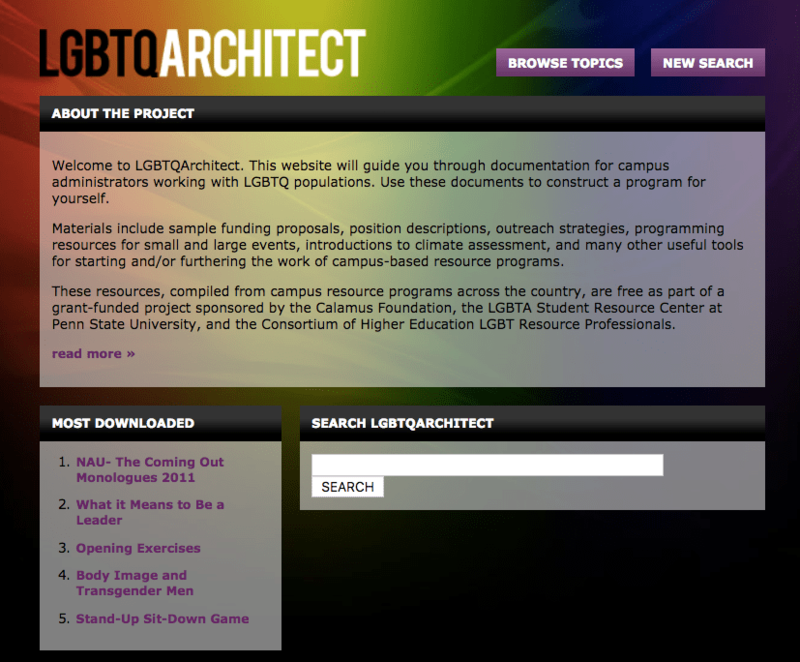 Then, visit their database of programming and policy curriculum, language, and models of practice in the “Architect”. I will typically click on “Browse Topics” to start my inquiry, because I haven’t found the search box to be accurate yet. Just to be clear, these resources are shared by higher education practitioners who support LGBTQ-inclusion and campus climate at their respective institutions. I love this philosophy! As long as you cite the source, you are good to use these powerful resources for the greater good. 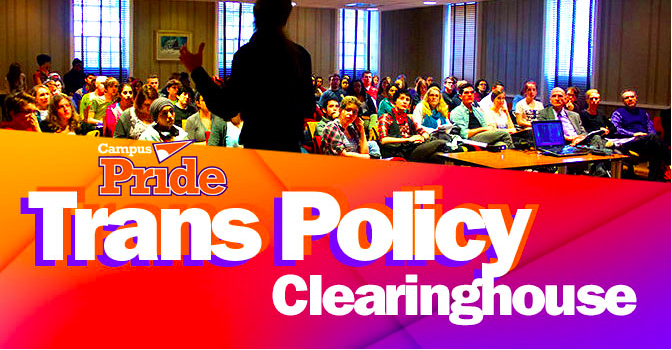 My second stop is the Trans Policy Clearinghouse, curated by Dr. Genny Beemyn (a leading scholar and practitioner in higher education transgender-inclusion). This resource is a collection of higher education policies that are transgender-inclusive intended for students, parents, and educators to reference regarding the state of policy at a prospective or current college or university. Dr. Beemyn regularly updates this list, with the most recent update on June 2nd! Cool, right? How do folx use this resource? Prospective students and parents can gauge how inclusive their college of interest is, educators can provide documentation to administration in making a case to revise how they ask “the gender question” or collect name and pronoun data, advocate for gender-neutral housing or restrooms, and update health insurance policies for employees and students. You might also find their Trans Resources list helpful. I refer higher ed practitioners to this checklist Dr. Beemyn created on a very regular basis, “Check the Box: Trans Checklist for Colleges and Universities”. Thanks for all your work Dr. Beemyn! TSER, or Trans Student Educational Resources, primarily focuses in K-12 domains AND I use their resources time and again for higher education training and workshop purposes. Honestly, I’m a big fan of all their graphics, especially Pronouns 101 and Gender Grammar. 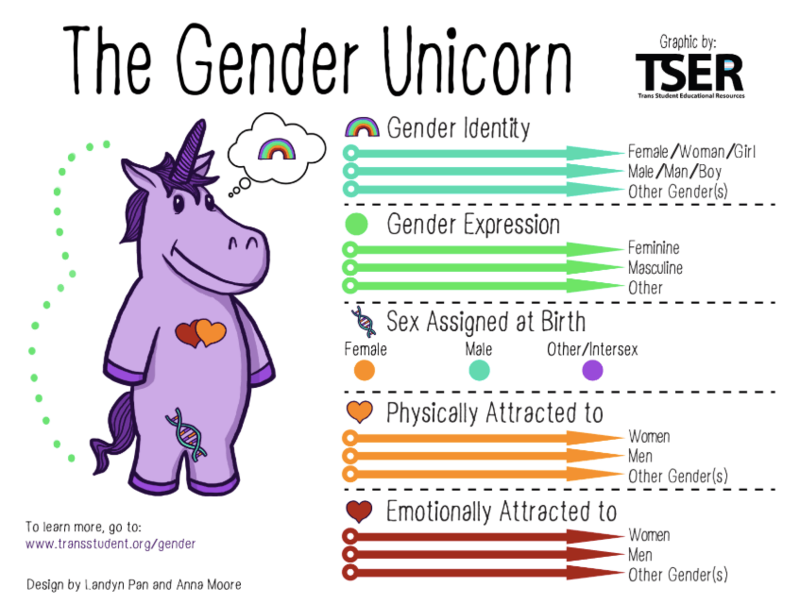 You may have seen their Gender Unicorn before…cute, right?! Have fun perusing their collection of resources. Consider supporting their work with a donation. I hope these resources are helpful in your journey to support trans and gender nonconforming students and colleagues. Keep learning and growing, practicing the use of pronouns in your meetings, introductions, and email signatures (for starters).